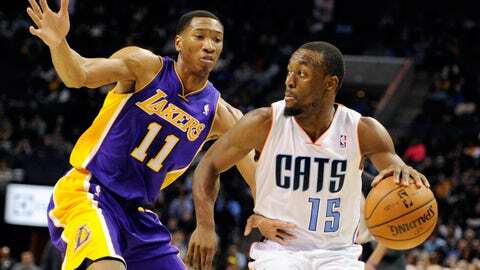 Kemba Walker had 24 points and eight assists, but it wasn't enough as the Bobcats dropped their third straight. CHARLOTTE, N.C. — If the Bobcats (10-14) don’t end up making the playoffs, they’ll have to look back at lost opportunities like Saturday night against the Lakers. Kemba Walker’s 18-foot jumper with 2:50 left on the clock had put the Bobcats up 85-79, but they were held scoreless the rest of the way as the Lakers (11-12) walked away with an 88-85 win. Two straight nights the Bobcats got the ball in the post to Al Jefferson trailing but needing a bucket to go ahead in the final minute. Neither night they came away with a victory, losing to the Pacers Friday night in a spirited game and then falling late Saturday night, too. Friday night’s loss in Indianapolis surely wasn’t easy, but they’re not expected to win that game. They should have closed out the Lakers, though. When the Bobcats got down one with 36 seconds left, Gerald Henderson missed a fadeaway on the baseline, but they got the offensive rebound, calling a timeout with 16 seconds left. Right off the inbounds, the ball went into Jefferson on the block. He worked right but wasn’t able to make the shot over his left shoulder. “That’s the play we want to run. I just didn’t make the shot,” Jefferson said. It was a similar outcome but different play in Friday night’s loss in Indianapolis. That’s the hard part of inheriting a roster where your best scoring option when you need a bucket remains having to force in a post feed. “If you want to look at it, in close games we’ve been good. In this league, lets face it what it comes down to is you want to look at the close games we’ve lost — (Chris) Bosh and LeBron (James), in Dallas [Dirk] Nowitzki and [Monta] Ellis and tonight we made some mistakes defensively but it was basically Kobe and (Pau) Gasol,” Clifford said. The better option is obvious .. have an elite wing scorer. Sure, you can shade to that side or double the ball, but a wing can hit tough, contested shots. It’s a lot tougher for a post scorer when that double comes to get a quality look. Two possessions before when the Lakers needed a bucket, it was clear out for Bryant time. Until the Bobcats have that type of scorer on the wing, the Bobcats offense is going to continue to sputter in late game and late clock situations. 2. Kobe Bryant was Kobe Bryant when it mattered. The Bryant in Charlotte Saturday night looked like the one we’ve always seen, especially late in the fourth quarter. He had done a nice job of taking what the defense gave him for much of the night, frequently flipping it to a teammate when the Bobcats sent help to Gerald Henderson. But when the Lakers needed a bucket most, Bryant went back into alpha dog scoring mode. First, Kobe gave the hesitation dribble to Henderson, dashed right and noticed the help overextend on the drive allowing him to smoothly float left, hang in the air and finish a beautiful finger roll to cut the deficit to one with 1:22 left. Then after a defensive stop, he got the ball on the other end with the clock winding down, pump faked on one of his patent fadeaways and got Henderson jumping, creating a foul which he calmly sank two off of to give the Lakers the final go ahead points. “The bottom line is we were one stop away from winning the game. We had to get one stop, one rebound. They would have had to foul. If we get one possession, one stop and one rebound, we win the game,” Clifford said. But they didn’t get it, and Henderson was kicking himself afterwards. It was vintage Bryant and has to give Lakers fans solace seeing the return to form in a game that was decided late. On the night he finished with 21 points, 8 assists and 7 rebounds on 8-of-15 shooting in 32 minutes in his best game back of the four he’s played since returning from offseason Achilles surgery. 3. The Bobcats are going to have a really hard time winning if they only get to the line eight times. When you rank dead last in the league in three-point makes, the scoring void has to get offset in other areas. So far to this point it’s come at the foul line, where they were fifth in the league in free throw attempts per game (26.9). When that’s gone, too, though? It’s brutally difficult for the Bobcats to score as it was Saturday night at times. It wasn’t a surprise they only went 2-of-13 from three, but the 5-of-8 from the free throw line was shocking, especially with the Lakers shooting 21-of-23. The Bobcats’ previous low up until that point? 16. That’s why it didn’t even matter that they committed less turnovers, shot a better percentage, and outrebounded the Lakers. “Obviously, the difference was three-point shooting and free throw line,” Clifford said. 4. It’s hard to take many positives from a game the Bobcats lost after leading by as much as nine in the third, but they’re doing a far better job of initiating possessions with post feeds. Clifford’s always maintained that it would be a process integrating Jefferson. The Bobcats never before had a guy who played like him to work through. That process was further stunted with his preseason and regular season ankle injury. But it appears everything is starting to get on track there. Jefferson’s posted 16.6 field goal attempts per game over his last five games after averaging 13.9 in his previous 10. He only went 7-of-18 Saturday night for 14 points, 9 rebounds, but Clifford’s pleased with the improvement in starting possessions through Jefferson and said much of it is due to Jefferson getting back into better shape as well.